Now how could I resist an invitation like that? 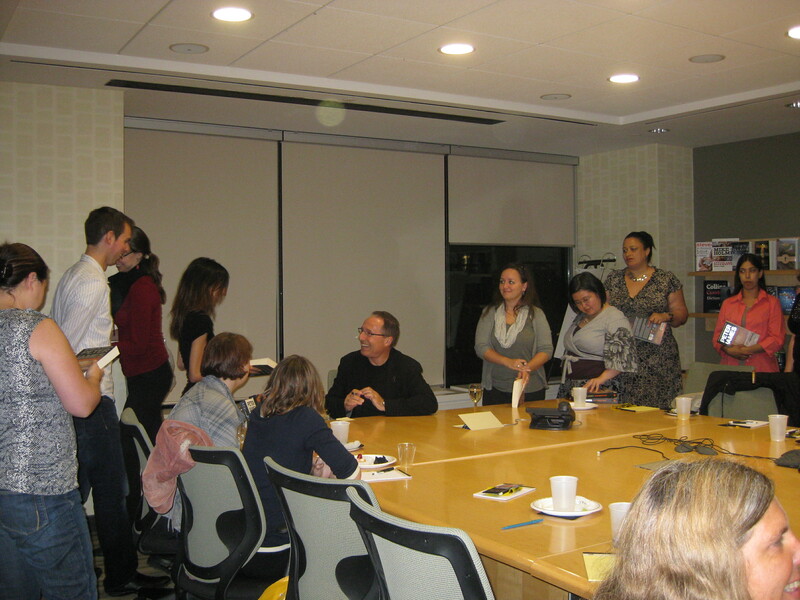 Meet an author, meet Harper Collins people I chat with on Twitter, and, most of all, eat snacks. Seriously, though, if you’ve caught my review of Peter James’ Dead Man’s Grip, you’d know that I’ve recently become a fan of his Roy Grace series. After meeting him last Wednesday, I must say I’ve become a major fan of the man as well. Sometimes called the real-life Castle, Peter James researches his novels by going out with actual police officers on their beats. Once, he was with some police officers when they encountered a group of drunken men. Off to the sidelines taking notes for a book, Peter realized it was about to get violent and that he had to do something. “So,” he told all of us gathered at the Harper Collins Canada office, “I immediately looked for the smallest guy.” That brand of heroism explains the tiny handcuff pin he was wearing on his lapel, a joke gift from a police force because that was about the size of the criminals he was capable of arresting. I don’t really know what I was expecting when I met Peter James, but it certainly wasn’t the super smiley, sweet and absolutely delightful man he turned out to be. After all, this was the man whose book turned me off salmon for weeks. (Interesting side note: I actually ate smoked salmon before meeting Peter, and regretted it when he mentioned the salmon scene in his talk.) Still, when he walked in with a glass of wine and a huge smile, he looked mostly like a kindly librarian, and you just can’t help but smile back. I’m very nervous when meeting authors, so it helped that Peter was so friendly. It was so easy to chat with him that Cory from Harper Collins finally had to step in at around 9 pm and suggest that we ask our questions while getting our books signed. I asked Peter if he ever spoke to criminals for his research. I personally found Tooth (cold-blooded killer for hire in Dead Man’s Grip) a very well-developed character, without us getting too much of his back story, which is very rare for thrillers. Turns out, he does. He wanted to find out the motivations behind various crimes, so, for example, he once interviewed a career burglar. It also turns out that Peter intentionally shows all three perspectives in his books: victim, cop and killer. It’s an interesting choice, something I liked in Dead Man’s Grip, and definitely not an easy balancing act. So here’s the deal: leave me a comment on this post by October 15. Imagine you’re a novelist. What’s the wildest stunt you’d pull to research or publicize your book? (If you can’t think of anything, just leave whatever comment you want. I just think it’ll be fun to see what kind of stunts you’d come up with. 🙂 ) One of you, randomly picked, will win a signed copy of Dead Man’s Grip. (Sorry, I’m keeping the cool bookmark and ever cooler yellow crime scene tape for myself. 🙂 ) Canada only, please. By the way, Peter is also in the running for ITV3 People’s BestsellerDagger Award. You can vote for him here till Oct 7th, 9 am. Whether you’re already a huge fan of the Roy Grace series, or you just want to give props to an author who’d actually lock himself in a coffin and risk drowning himself in a van, you can vote there up to 5 times. 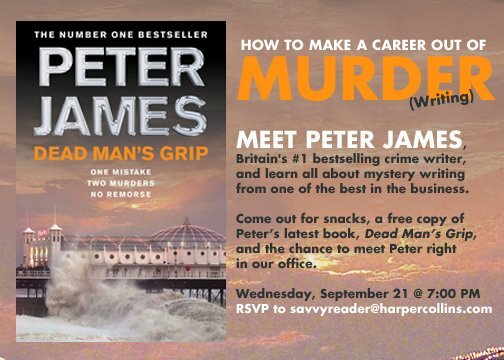 Bonus: If he wins, Cory from Harper Collins Canada has promised to throw an authentic English fish and chips party like the one Peter James promised his UK fans. Personally, I like Roy Grace, I think Peter locking himself in a coffin is insane but kinda cool, and I love fish and chips. So I voted. EDIT: Yay! Peter James won the People’s Bestseller Dagger Award! Very well deserved, in my opinion. Another Dagger winner is S.J. Watson, whose novel Before I Go to Sleep kept me up all night, literally. Loved it and blogged about it here. Do leave a comment for your chance to win a signed Dead Man’s Grip. Trust me: you’ll love it. This entry was posted in Non-Book Review Posts and tagged Author Encounter, Giveaway, Harper Collins, Mystery, Thriller by Jaclyn. Bookmark the permalink. I’m a big coward so I won’t be getting locked into coffins or anything else extreme. But let’s say the villain of my fictional thriller is an arsonist, I would probably go through some form of firefighter training, more out of my personal curiosity that publicity stunt value. I enjoyed reading about your author encounter! I started reading Peter James a couple of years ago and everything I have read has been brilliant. I live in West Sussex and love the fact I know the places that The Roy Grace series is based. All Peter James are a joy to read. I haven’t read any of Peter James’ books yet- but I’d like to! I have read some reviews of this book and everyone seems to love it. If I was an author, I might try jumping from one building to another or jumping off a building (if there was something below to catch my fall, of course!). That’s often how the bad-guy / killer gets away from the police or whoever is chasing him. And to me, it looks like fun! I would sneak into unauthorized areas of a hospital. Thanks to everyone who have entered so far! Can’t wait for one of you to read and enjoy Dead Man’s Grip! Also hope the rest of you get a chance to check out Peter James. Let me know if you do and what you thought of the Roy Grace series! I sent you a DM on Twitter.